Jerilyn Veldof struck a unique profile at the ACRL/NY’s 2015 symposium on ALA core values as the sole speaker to address the values of education and professionalism. A series of earlier panelists had grappled with the question of diversity in academic libraries, so the day changed key dramatically when Veldof took the podium to offer a sobering and energizing talk on demographic change and professional development. Veldof drew on her eighteen years at the University of Minnesota Libraries—most recently in the self-created role of Organization Development Associate—to argue persuasively for ways academic libraries can deal with an oncoming shift in the demographics of the academic library workforce. We are in the midst of a “Silver Tsunami,” Veldof warned—an epic wave of retirements that is beginning to sweep over the field. People are now aging out at an “alarming rate,” she said, but this process is not going to open up jobs for younger workers. Instead, economic exigencies are going to leave many vacated positions unfilled. The remaining labor pool will be forced to juggle the same set of tasks with fewer hands. A crisis looms: if libraries are unable to develop the current workforce to take over the retirees’ tasks, they will succumb to entropy. Two other major socio-demographic developments are also conspiring against academic libraries’ chances of surviving this tsunami. There are the incoming millenials, who will make up 70 percent of the workforce in ten years’ time. This new generation is quick to chase after challenges, all too ready to depart for new jobs elsewhere. Then there are the outgoing—but not fast enough, Veldof opined—“working retired.” For all the gloom of the shadow cast by the mounting Silver Tsunami, Veldof reveals a paradox: many older employees are sticking around too long as “low directive and low supportive” team members. Having put in their time and paid their dues, they are content with career stasis and no longer add energy to the organization. Far from prognosticating doom, however, Veldof urges academic libraries to adopt a composite solution formed of insights from human resources, psychology, and management theory. The strategy Veldof proposes to retain millenials and to electrify the working retired is a rigorous program of twenty-first-century-style professional development. The traditional repertoire of workshops and conferences has its place, says Veldof, but “for many of us, it’s not enough.” These formats are often too selective, tacitly reserved for leadership or “high-potentials”; they are too limited and lack accountability, follow-up, and integration into the job. Veldof’s program is much more comprehensive. It does not simply add professional development to existing organizations. It requires changing attitudes toward work and career, refining leadership styles, integrating learning into everyday work routines, and altering hiring practices. The attitude change Veldof advocates requires managers (or non-managerial employees themselves) to make a fundamental conceptual shift from a “fixed mindset” to a “growth mindset”—concepts elaborated by psychologist Carol Dweck to specify the mental foundations of mediocrity and success. By abandoning pessimism and embracing optimism, leaders, individual workers, and whole organizations can release the untapped potential energy needed to tackle the impending future of workforce scarcity and workload overload. A second aspect of Veldof’s program calls for the use of a “situational leadership” model for library management. This approach, developed by Paul Hershey and Kenneth Blanchard, posits a stratified categorization of development among employees ranging from “low directive and low supportive” to “high competence and high commitment.” With such differences in mind, managers calibrate development challenges to workers according to the level of productive capacity each one manifests. This flexible management style maximizes resources by tailoring professional development closer to individual needs than the one-size-fits-all model—to which organizations often subscribe—can do. A third move Veldof advises is for libraries to institutionalize learning and development. Academic libraries, she argues, should recognize that since they already spend some $2 million over the span of each employee’s career, an investment of a few thousand dollars per year per employee for development promises to be highly cost-effective in terms of productivity. Development activities (as well as contributions of service to the library and/or university) must also be embedded in job descriptions and expectations. Development coaching (i.e., via the established GAPS and GROW models) offers a major vehicle for such institutionalization, as do a host of more discrete techniques that Veldof mentioned quickly: a one-hour-per-week per employee development plan; something called “micro-learning”; the use of the flipped classroom; mandated local conference attendance for those who do not normally see professional development as part of their work (i.e., technical services staff attending a technology conference); invited speakers with follow-up discussions at the departmental level, and so on. A final adjustment Veldof suggests is to rethink hiring. Instead of recruiting primarily for skills and experience, managers should consider prioritizing potential, attitudes, and (working in the day’s main theme) diversity in their hiring decisions. Doing so takes into account the goal of having employees expand their skill sets on an ongoing basis, engage in leadership and innovation, and strengthen team capacities by drawing upon multiple cultural aptitudes. Responding to a question about how her proposals relate more specifically to diversity, Veldof connected the mindset concept to racial inclusiveness. A fixed mindset in white people, she suggested, prevents them from talking about the issue for fear of looking bad. Libraries’ evolution in this area depends, she said, on whites adopting a growth mindset. Cultural sensitivity training is part of the mandated and institutionalized development system she advocates. She cited a “scheduled conversation” about implicit bias, something the University of Minnesota Libraries now requires, as an example of this type of development. 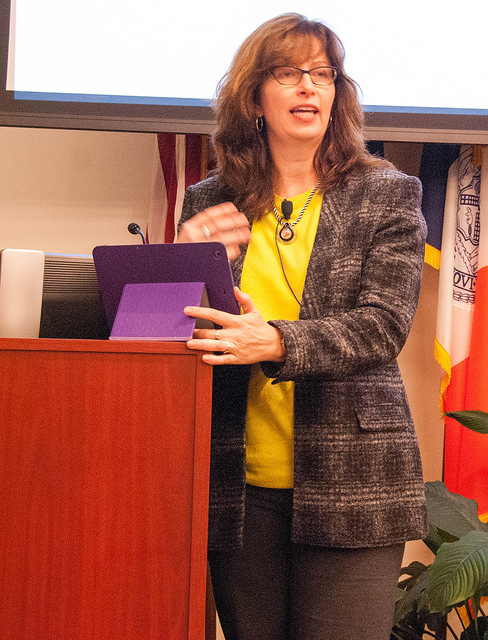 For library workers whose employing organizations do not reflect the type of forward-thinking development leadership Veldof envisions, she suggested a “do-it-yourself” approach that can include forming peer coaching partnerships—or simply affinity groups—for those seeking to learn and grow. Another option is to take the initiative to request assistance for coaching from human resources departments. While other speakers at the symposium focused a spotlight on social justice in relation to the demographics of the library profession, Veldof raised a question of professional and organizational adaptation in the face of demographic changes beyond anyone’s control. As the Silver Tsunami crashes down upon us, it is difficult to imagine how academic libraries will thrive without implementing the kind of changes Veldof suggests. This entry was posted in 2015Symp and tagged 2015 Symposium, Professional Development by Derek Stadler. Bookmark the permalink.